Alright, let’s all take a second and freak out. Yes! I am posting again. I came to realize I started this blog, I should probably get back to it. I don’t know if anyone is reading it, but it certainly helps me on my walk with the Lord. The Heart Man has a simple purpose, just look at the tagline, “Discovering how to be a man after God’s own heart.” My life has changed quite a bit over the past year, but one thing has honestly stayed the same, I’m still seeking to be a man after God’s own heart. 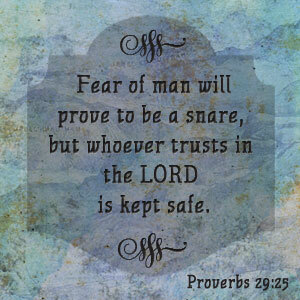 Today I was reading my devotion; the passage was on Proverbs 29:25. It reads, “The fear of human opinion disables; trusting in God protects you from that” (MSG). This means to us that when we fear what other people’s opinion of us is more than God’s, we are often kept from either doing the right thing or keeping in step with God. How many times do we see someone, whether it’s a complete stranger or someone you know well, and they are struggling with something. We know what their help can be. We know who can best help them, no matter the situation. But how many times do we actually speak with them about Jesus? Instead, we often tell ourselves that they would not be interested in the Gospel or they are already against it so why bother. I think this shows us more of an issue with ourselves than with the person we are not talking to. When we don’t share the gospel, we are either showing we don’t love Jesus as much as others opinions of us, or we don’t love the person as much as we think we do. If God’s opinion of us is what matters most, this entire problem is done away with. You want want to disappoint your God, so you will actively tell people about their Savior. My hope for you today is that you can turn away from the fear of man. It keeps us from doing the very work that God put us on this earth to do. Instead turn your eyes to the one who loves you most. This will give you the strength to not only do your daily tasks, but you will also be able to win hearts and souls for Christ.